How to Find High-Quality Diverse Literature. I share a series of questions that I consider when looking at and evaluating books. Raising Global Citizens - discuss the "village." Sharing a favorite book of mine for talking to kids about the statistics of people in our world. Poetry Friday: Echo Echo. It may have lost the championship of our poetry round, but Echo Echo remains a fan favorite. Post includes student poems inspired by the book. 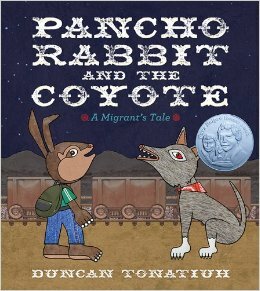 Pancho Rabbit and the Coyote: a migrant's tale (2013) by Duncan Tonatiuh [a Pura Belpré Honor book]. I was thrilled to hear Duncan Tonatiuh speak at last year's NCTE (though I was disappointed by the showing of my fellow educators - five others). He talked through much of the story behind this book as well as sharing examples of how he does his artwork and compositing. Migrant: the journey of a Mexican worker (2014) by José Manuel Mateo and illustrated by Javier Martínez Pedro. This book is an incredible work of art. Designed in the style of a codex, the book is one giant illustration that folds down in on itself to become the book. One side has the text in English, the other in Spanish. The story itself is a realistic version of the folktale above, only this time the two children and their mother head north in search of their father who has not returned. I haven't shared this one with my students yet, but my one complaint is that the artwork is so intricate and detailed it would be impossible as an all-class read aloud. Even just reading it alone, I wished the book had been larger so that you can really immerse yourself in the illustration. Incredible. Thank you for sharing these books. BOth look like important books to invite students into thoughtful discussions of immigration. Now if we could just get the politicians to read and listen and respond thoughtfully as well. I agree with Kay before me. Great books. I wonder if using a document camera to enlarge the images would make Migrant more accessible. I was blown away by Migrant, even showed the librarians so they could display it. I need to find Pancho Rabbit & The Coyote! Thanks, Katie. Pancho Rabbit is a great resource. I am so impressed by Migrant. It is a difficult one to share with a large group, but would be perfect done with a small reading group or at a station. Agreed, Crystal. Several of my students chose to read it in small groups later.